It was one of the saddest days of Scottish Football when he was tragically taken from us in April 1995. At this moment he was still 39 years old. Super Cooper was a true blue. Genius is an over-used tag but it applied to Coop. He possessed a left foot on a par with Baxter and dazzled defenders with his stunning wing play and magnificent crosses. A match-winner in every sense of the phrase, his death from a brain haemorrhage at the age of 39 in 1995 stunned the nation. Many rate him as one of the most gifted Scottish players of all time, up there with Denis Law, Jim Baxter and Kenny Dalglish. With the ball at his feet, no-one knew what to expect - except, perhaps, the unexpected. He would run at defenders, show them a glimpse of the ball, pull it back, feint and then with a shimmy he would be gone - often past several players. He joined Clydebank, receiving just over �300 as a signing on fee. The money, in fact, was the previous night's takings from the Bankies social club. 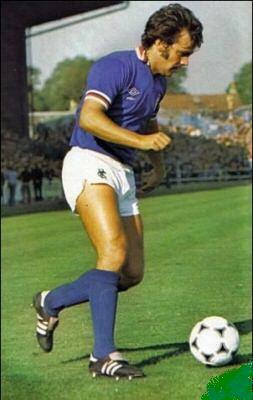 Cooper was duly signed for Rangers by Jock Wallace in June 1977 for �100,000. That he was a largely a one-footed player became a joke among his team-mates. At his testimonial dinner, Ally McCoist, on behalf of the players, presented Cooper with something they said he'd always wanted - a dummy right leg! The Press, however, dubbed him "The Moody Blue" because of his unwillingness to give interviews. Cooper was never one for the hype and preferred to do his talking on the pitch. That season's League Cup victory was his first in what became seven winners' medals in the competition as Rangers beat Celtic 2-1 in 1977-78, Aberdeen 2-1 in 1978 79, Dundee United 2-1 in 1981-82, Celtic 3-2 in 1983-84, Dundee United 1-0 in 1984-85, Celtic 2-1 in 1986-87 and Aberdeen on penalties after a 3-3 draw in 1987-88. He claimed to have been a lazy player, but when Jock Wallace returned as Rangers manager in 1983 the first words he spoke to an out of condition Cooper were: "You've got three weeks to lose half a stone." Cooper did it in five days. Souness was to say that Cooper "was as responsible as anybody for the success in winning the Championship. He could place the ball on a sixpence and caused teams all sorts of problems." 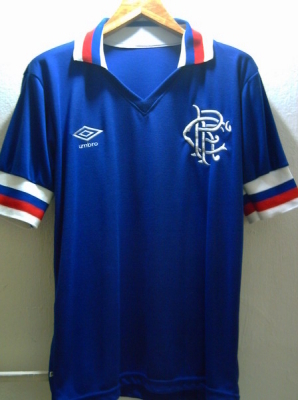 By season 1988-89 he had stopped being an automatic choice and went to Motherwell in search of regular first team football in August 1989 for �50,000.On Sunday 20th March at Hampden Park people saw the first Cup Final of the season in Scotland when Rangers beat Motherwell 5-1 in the CIS Cup. However, for many the match was a tribute to a man who played for both clubs and graced the Hampden turf for his country on many occasions. This man had magic in his boots and gave his fans many, many magic moments. 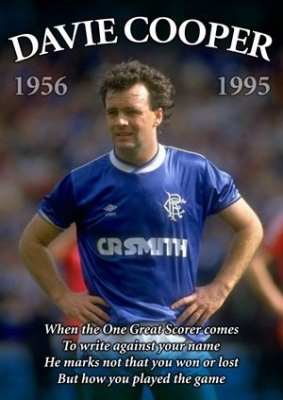 His name was Davie Cooper. Cooper died on the 23rd March 1995 from a brain haemorrhage and left those behind him, family, friends and fans in a state of shock at the loss of such a great player. Indeed former Rangers legend Ally McCoist said that the players had "lost a brother" and Old Firm rival Tommy Burns declared that Scotland had lost "a national treasure". It is perhaps fitting that the match was renamed the "Davie Cooper final". Davie Cooper played in 7 League Cup finals for Rangers and 1 outstanding Scottish Cup final for Motherwell in an epic 4-3 win over Dundee United. There is no doubt that Cooper has left each and every fan who saw him play for any of his clubs or his country with special memories of this special player. He scored in 4 of the Cup Finals and was Man of the Match in the 1984 Scottish Cup Final against Dundee United as his dazzling wing play deserved. 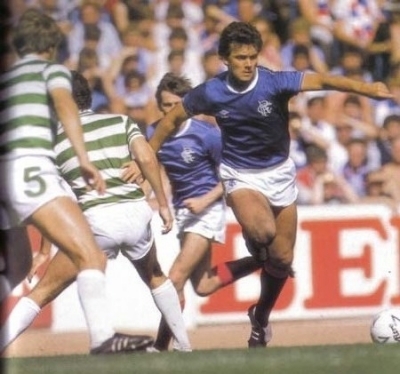 His dribbling and wing play left players and fans looking on in awe of 'Super Cooper', and if you where lucky enough to see him then you will know what I am talking about. He scored stunning free-kicks,penalties and simple tap ins, aswell as important goals for Scotland including a penalty against Wales that took the Scots to the 1986. Cooper was the man for the big occasion, super cool in even the most tense atmosphere. Even the opposition fans would want Cooper in their team. He was respected as a man and a player by so many, and when he died fans from every club left their colours at Ibrox and FirPark.